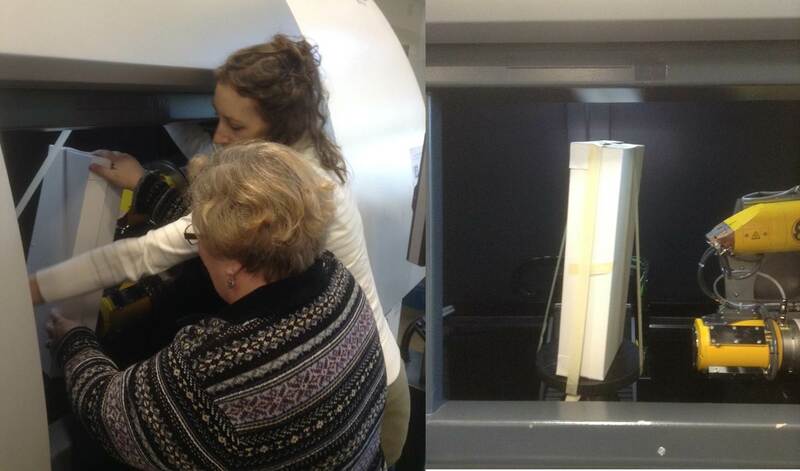 Last Friday, 7 of us from our conservation department took a group of objects from the museum to the GE Inspection Technologies Customer Solutions Center in Lewistown, PA for x-radiography and CT scanning. Now, wait just a second, you might be thinking. Doesn’t Penn have its own x-ray and CT scanning equipment? Why did we have to take these objects all the way to Lewistown for this work? Good questions, and we have a good answer. We just received word that in early 2014, construction will begin on our new conservation labs, which will include a digital x-ray suite. We plan to purchase the x-ray unit from GE, so a visit to their facilities was a chance for us to demo the equipment using some of our own artifacts! The object I was most eager to image was our falcon mummy. X-ray and CT (computed tomography) scanning technology allow us to “virtually unwrap” this mummy, helping us understand how it was made and what is inside (and as visitors to the lab have heard me say, we can’t assume that there are any falcon remains inside-we can only hope!). Hooray! In this first attempt, we could already see that there are bird remains inside. The bright white material concentrated in the center of the mummy wrappings is the skeletal remains. In radiographic images, materials that are denser appear white because they do not allow x-rays to pass through. Materials that are less dense (such as the textile wrappings surrounding the bird bones) appear darker, because the x-rays are penetrating and passing through these materials. We can see in the image above that there are no skeletal remains in the “head” and the “feet” of the falcon mummy – these areas appear to have been sculpted with fabric. The slightly brighter white area near the feet just reflects an overlap of textile in that area. While we were excited by this image, it immediately prompted more questions. We can see bird bones, but where is the skull? How much of the bird body is present? Are there any clues as to how the body was prepared for mummification? To answer these questions, we turned to the CT scanner. 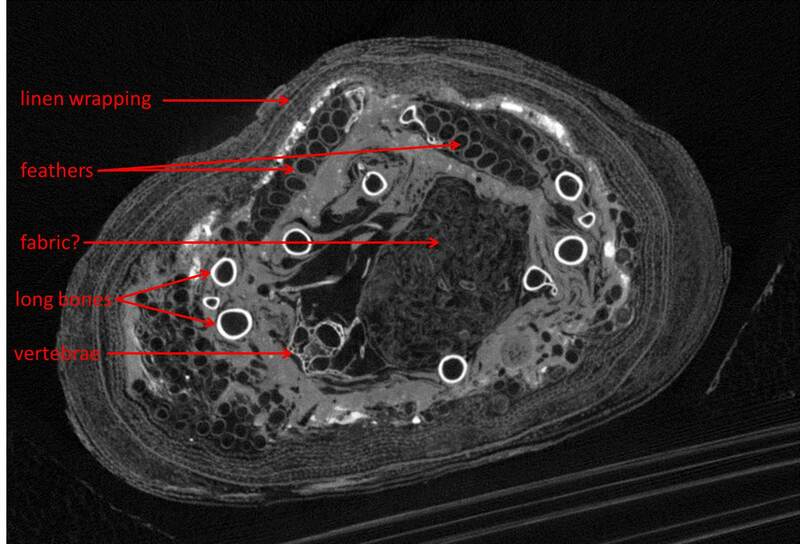 CT scanning uses x-rays to produce cross-sectional images of an object, which can then be combined to produce three-dimensional views. CT provides a much more detailed look inside objects, and better distinction between different materials. The CT unit at GE does not look like a medical CT scanner that many people may be familiar with. 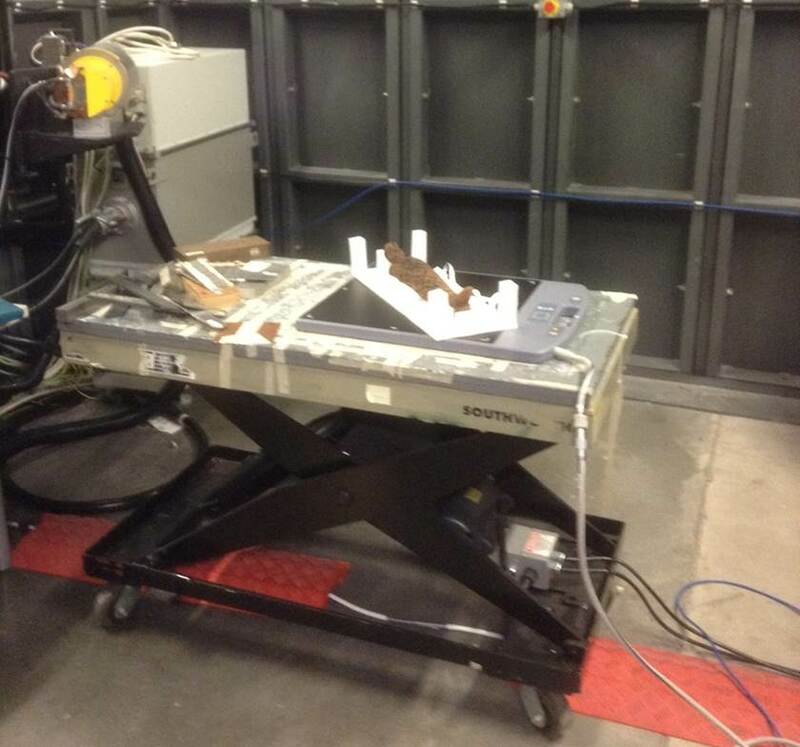 To scan the falcon, we had to stand the mummy upright in its box, which we then secured to the rotating stage inside the CT chamber with masking tape. In this image, the bones are visible as the most radio-opaque materials (so they are bright white). We were also excited to see the feathers, clearly visible as little circles reflecting the cross-section of the feather shafts, which are hollow. The various layers of linen wrapping are also very clear – clear enough to count! But other details are not so immediately clear to us, including the presence of the skull, and exactly how the remains were prepared. 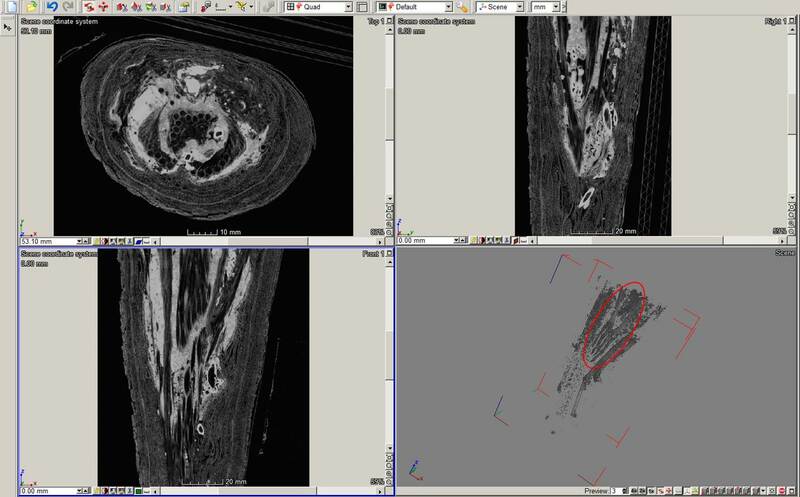 Here is a screen shot from the program we are using to view the CT images, showing 3 different cross-sections, and a basic 3D rendering of a section of the falcon mummy. In this 3D rendering, we can clearly see the falcon’s talons, circled in red! We will need to spend time with the images, and consult other specialists, to better understand what the CT scans have revealed. 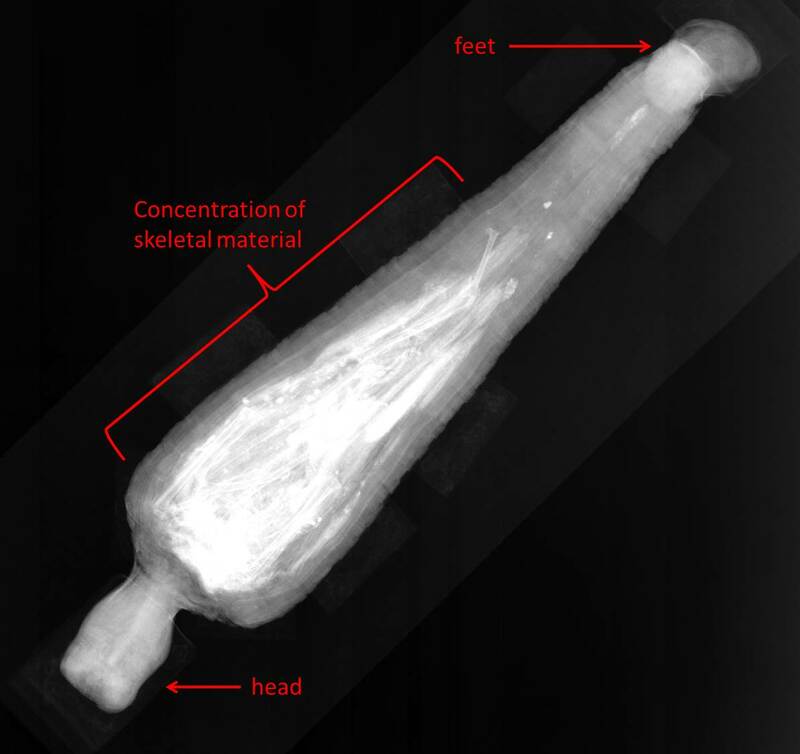 We will follow up later with more images and interpretations of the falcon mummy CT scans, plus more about the other objects we were able to examine. 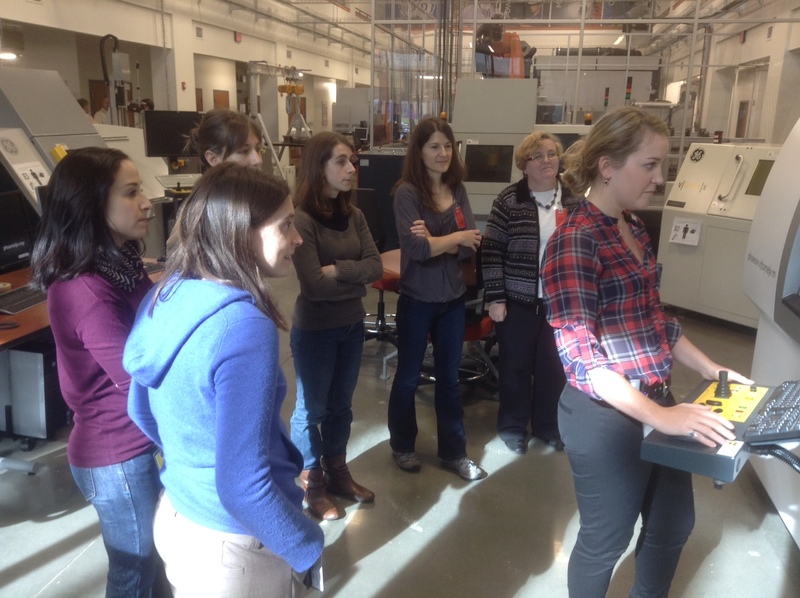 A special thank you to Becky Rudolph and Hank Rowe at GE for spending the day with us, and for their expertise! I have a special treat for our readers today – I recently had an interesting discussion with Casey Mallinckrodt, a current graduate student in the UCLA/Getty Program in the Conservation of Archaeological and Ethnographic Materials (which is also my alma mater!). As part of her graduate studies, Casey has been working on a rare example of an Egyptian child sarcophagus, and instead of recounting the conversation for everyone, I asked her if she’d be willing to answer a few questions for our blog. Read on to hear more about Casey and this fascinating project. 1. First, tell our readers a little more about yourself. I am a second year MA student in the UCLA/Getty Program in the Conservation of Archaeological and Ethnographic Materials. This is a career shift for me having received an MFA in sculpture in 1988 and having had a career in fine arts and education. I did pre-program internships in conservation at the Museum of Modern Art and the American Museum of Natural History in New York before applying to this program. I am working on this project with Dr. David A. Scott and Prof. Ellen Pearlstein, both of whom are faculty in our program. 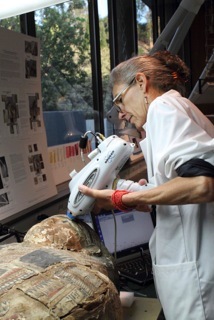 Marie Svoboda, a conservator of antiquities at the Getty Villa, and Dr. Kara Cooney, an Egyptologist at UCLA are advisors. 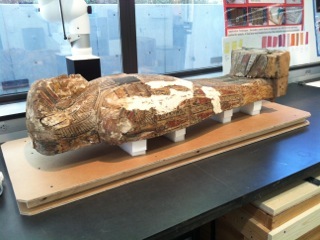 The sarcophagus (or coffin) lid is on loan for this project from the San Diego Museum of Man. It was given to the museum in 2001 and it dates to the Ptolemaic period, 305 – 30 BCE although the exact date of this object is not known. 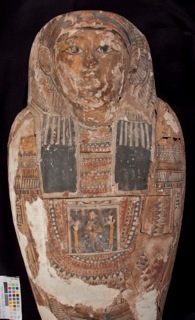 It is unusual because sarcophagi were costly and rarely made for children. This is supposed to be one of only seven from this period known to exist. It seems to have been for a girl, and scholars I consulted suggest she may have been a child wife, which would justify the expense. Many people have asked about the mummy and the base of the coffin but these are unknowns. It is made of a carved out section of a tree trunk with pieces added to create the chest, face and foot. Wood dowels were used to secure the pieces in place. The exterior is completely covered with a polychrome layer made up of a base of a brown granular paste, then a white “gesso” layer and the paint applied onto that. The interior is unpainted. 3. What is your ultimate goal for this project? The project is a technical analysis of the structure and materials, and development of a treatment plan. The treatment goal is to stabilize the structure and fragile paint layer, and reduce or removal modern fills that may be damaging the original materials. If the museum approves I will carry out treatment in selective areas to establish a protocol so the museum can continue the work after the coffin returns to San Diego in June. 4. Since I get asked this question almost every day, I’m going to turn around and ask you – what is the most interesting and/or unexpected thing that you’ve found so far in your work on the sarcophagus? It is a fascinating project in so many ways, but two things come to mind. One involves the manufacture, and the other a mysterious surface condition. The ancient Egyptians frequently reused parts of coffins and I have found evidence of reuse here. X-rays reveal empty dowel holes that indicate changes in the structure, and there are modern metal screws holding the foot block in place. X-radiographs of the head (left) and foot (right) of the sarcophagus. Note the modern screws holding the foot together. Scholars I have consulted find the carving of the face more consistent with earlier periods. I am examining the types of wood and indications of changes in the construction, and analyzing the pigments, gesso, fill materials, and coatings to identify differences that might point to different sources for the different parts. The most unexpected development was the emergence of small waxy exudates on the lower front of the “torso”. I am doing chemical tests on samples, and FTIR (Fourier transform infrared spectroscopy) is being carried out by Getty Conservation Institute Scientist Herant Khanjian to identify the substance and determine whether it poses a threat to the original materials. This is probably the result of a coating or consolidant that was put on the object, but there is no record of its treatment before SDMM acquired it. Thanks Casey! This is a terrific project, and a great example of how conservation is often a very collaborative process, involving conservators, scientists, archaeologists, and other specialists. I will be keeping up with Casey as her work progresses. For more information on the UCLA/Getty Conservation Program and other student projects, follow the links I’ve included in the text above. Martha Gerhardt on Ask the conservator! Conserving Antiquity Interesting website for an exhibition of the same name at the Kelsey Museum of Archaeology. Includes videos about conservation and treatments of Egyptian artifacts. Cultural heritage science open source A blog about methods for art examination and documentation, targeting specifically innovative low-budget scientific solutions. Penn Museum's Blog Lots of cool content from the Museum as a whole. We will be posting synopsis blogs here approximately once a week but for the latest scoop from the Artifact Lab, bookmark our blog!